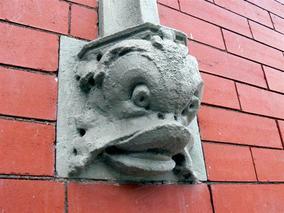 In the late nineteenth century , Vine street was the backbone of the “Paris of America”. Besides Wielert’s Pavillion and Beer Hall, there were sixteen other concert halls on Vine between the canal and 15th Street. 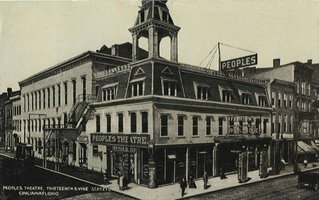 These included Kissell’s at 1209-1217 (now a parking lot), Schickling’s, Hildebrand’s, and the People’s Theater (now Venice Pizza) at 13th and Vine where Buffalo Bill and Wild Bill Hickock regularly performed. Despite the success of concert halls, most people frequented the saloon, and these were in no short supply as there were 136 on Vine St. alone in 1890. Saloon’s only served one brand of beer, and were sometimes owned by a brewery and leased to a proprietor. The saloon functioned as more than a place to get drunk. 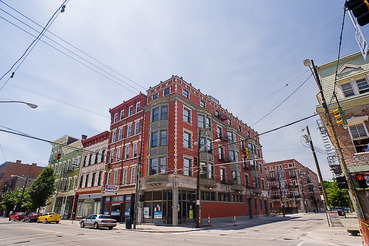 It was the centerpiece of life in OTR. The saloon was different from the classic British Tavern that dominated early Cincinnati in several ways. Entertainment: The saloon was a place for live music, dancing, lectures, quilting bees, and sometimes even weddings and funerals. Food: The standard price for beer was 5¢ a glass, and with the purchase of two of these glasses, it was the custom at lunch time to serve a buffet of roast beef, ham, rye bread, pickles and a variety of cheeses. Lodging was not a component. Tables: Rather than just having a bar, tables were present in the common saloon—this was conducive to conversation. Financial transactions, real estate deals, or business partnerships were started and ended here, and the politics of day and philosophy were debated here in the German tradition of the “Stammtisch” (which loosely means regulars’ table). It is thought that the institution of the Building and Loan originated from the saloon. The common bond of beer and music united people even in different social classes. As the primary outlet for social activity in the 19th century, saloons played a huge role in Ward Politics in Cincinnati. In 1890, Sunday was the only day that people had to spend with their families, and after church, that day would often times be spent in the saloon or beer garden which supplied a meal, malty refreshment, and entertainment. Sundays, generally their only day off, were referred to as “Continental Sundays”, and would spend the day at park or one of the Incline “Houses” for relaxation, fun, and drinking. Taking this in mind, one can understand the threat Sunday Closing Laws posed to the culture and life of OTR. 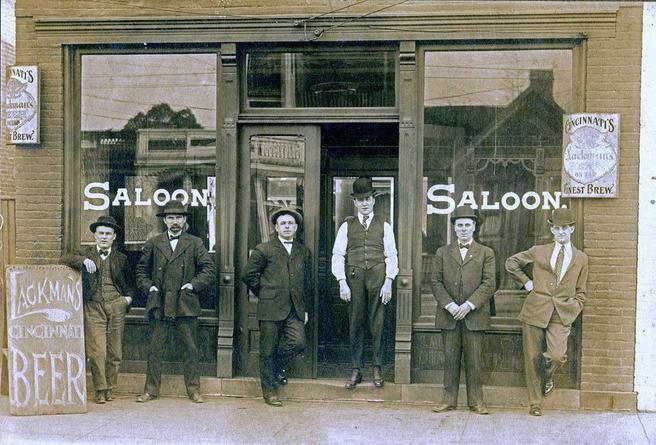 Most saloons were allowed to operate if they had a friendly relationship with their local police officer—who would be provided free beer, lunch every day, and tips on holidays. All that was required was that customers enter through the back door. Saloons who didn’t have a back door—or didn’t like their officer —had lookouts posted by their barkeeps. A saloon located on a corner had the distinct advantage if this route was taken. Herman Lackman constructed this 1892 building for investment on the site of old circus grounds with money earned from his brewery on W. 6th St. In the late 1920’s, G.C. Bauer, drugstore, was located here and in 1942, Muhlberg Pharmacy was here. 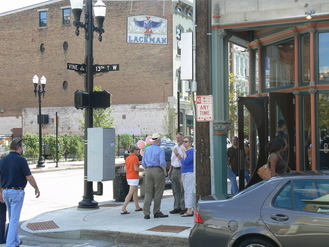 Various bars or bar-restaurant combinations have located here over the years: Curly’s; Jean’s; George’s; and Judy’s. 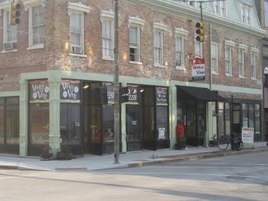 Elliot’s Grocery predated a fashion and beauty supply company that occupied the space before 2008. 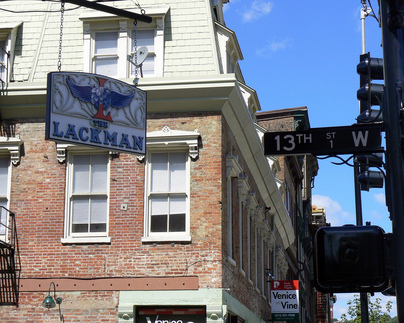 Lackman touted that his beer was made only with well water from his five wells. In 1890 he produced 45,000 barrels of beer. 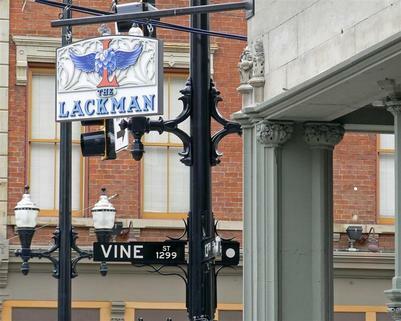 Lackman’s brewery closed in 1919 and was absorbed into the Hudepohl Brewery that was adjacent to it. As was the custom of the times, saloons owned by breweries served only their brand of beer: the saloon would have served only Lackman beer. A corner location was preferred for saloons because of the exposure it gave the store and because it was easier to spot police on the way, if beer was illegally sold on Sundays. 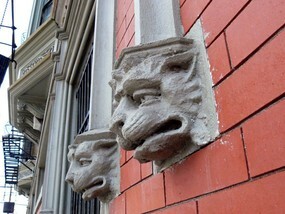 In Over-the-Rhine, German custom overrode the law, and beer was sold every day of the week. 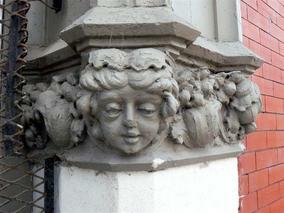 heads at eye level, and above, on this typical German corner saloon.